A prominent Muslim leader in Canada attacks Ontario premier for not allowing Al-Quds Day rally outside of parliament. A prominent leader of the Muslim community in Toronto took advantage of the Al-Quds Day rally in the city’s downtown to incite against Israel and wish for the end of Zionism, Shalom Toronto reports. Saturday's annual rally took place this year north of the Ontario parliament building, after the provincial government rejected a request by the organizers to hold the rally in front of the parliament building as they had done in previous years. 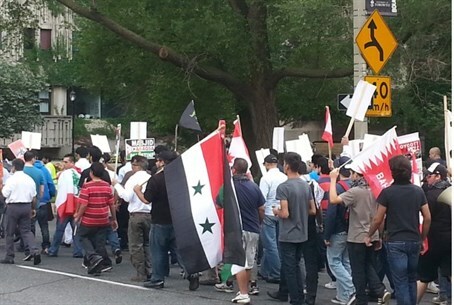 Sunni Muslims boycotted the rally, most probably because of the war crimes carried out by the Assad regime of Syria with the full military support of Iran, Iraq, and Hizbullah, but the participants nevertheless proudly waved the flags of Syria, Iran, Hizbullah and the PLO. Al-Quds Day has been marked since 1979, as decided by Ayatollah Khomeini and the Iranian government, on the last Friday of the Ramadan month in order to express the support of Iran and the Muslim world of Palestinian Authority Arabs and “the liberation of Jerusalem,” to discredit Israel and call for its destruction, and to defy the United States and other western powers. Zafar Bangash, a noted Islamic movement journalist and commentator and a leader of the Muslim community in Toronto, spoke at the rally and stressed the importance of focusing on the struggle to “liberate” the Al-Aqsa mosque, according to Shalom Toronto. He attacked the Ontario Parliament’s decision not to allow the rally outside the parliament building for reasons of security, noting that in the 25 years in which the rally has been held, it was always held in the same location without a problem. He claimed that the only threat comes from the “bullies on the other side," referring to Jewish Defense League activists who held a counter-protest to the Al-Quds Day rally. "Queen’s Park has become a Zionist occupied territory," charged Bangash, referring to local Jewish organizations that lobbied parliament asking it not to allow the rally to take place. He criticized Ontario premier Kathleen Wynne, who found it necessary to participate in a march for Israel while showing a hostile attitude towards the Al-Quds Day rally, he claimed. "(Prime Minister) Harper and Wynne are leading Canada in the wrong direction,” he said. He described a vision “for the future of Palestine” as the establishment of a state not based on ethnic cleansing, but one which treats Jews and Christians as equal citizens, noting that Muslims gave shelter to Jews during periods when they were under persecution and oppression. "Zionism will be eternally shamed," promised Bangash. The annual rally in Toronto in honor of Al-Quds Day is always used by extremists to de-legitimize Israel and spread hatred towards Jews. Last year, a Jewish high school teacher from Toronto was warned by local police that he is inciting a riot and could be causing mass violence by carrying an Israeli flag. Toronto police also arrested a Jew who shoved back a Muslim who punched him for not moving his “unclean” dog further away from Muslim women during the rally. The Muslim attacker was neither arrested nor questioned.